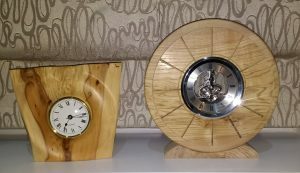 My wood turning journey blog plus things that interest me! You are what you Surf, the internet not the big blue ocean waves! Woodworking & things of interest! The time is turning away! Well over time, please excuse the pun, I intent to produce a number of clock designs. They will highlight the different UK timbers available to turners. Plus I will explore adding colour and different effects. Making a clock is a fairly straightforward project. Things to consider are the overall size and style of clock. The timber to be used and the clock mechanism you are going to fit. Then you need to think through the process of producing it. Planning the project is something we fail to do when we start out in woodturning. We just want to get turning and to be making shavings. I admit it took me a long time to realise the importance of planning the sequence of operations to produce a clock. Just a few notes or a sketch will suffice. But do think it through and save yourself possible problems later on when at the lathe turning. All I can do is sing its praises as the process works, the theory behind it is easy to understand and it is very cost effective. Shake the can, then spray, and yes this is the better way! Two books, about the Afghan war, that illustrates the UK’s Army & Navy support for one another.